Ru Yi symbolizes authority and control. Ru Yi was previously held in the hands of Empress, Dowagers and High Level Officials. The symbols is also usually being held by Laughing Buddha, Fuk Luk Sau and Tua Peh Kong. Ru Yi brings us protection from gossip, unobedient employees, political stabbing in office and country level. 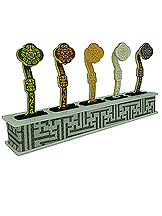 Ru Yi is also a powerful sign that encompasses health luck, wealth and long life. Click here to learn more about Ru Yi and how to apply it in your Feng Shui! 1. The head of the ruyi is adorned with five bats denoting "Five Blessings", namely longevity, wealth, health and composure, virtue and good health. 2. The upper body is adorned with bamboo which is a symbol that helps you thrive during the good times and conserves energy and survives through harsh conditions. The bamboo symbolizes success that lasts. Its ladder-like segments is a good connotation of steps leading to the seat of power and promotion after promotion. 3. The center is adorned with two bats facing each other denoting "Double Happiness". 4. The lower body is adorned with lotus and fushou. Signifying joy, peace, purity and sincerity, the lotus dissolves hostilities. Known as the Palm of Windfall, the fushou brings about windfall luck. 5. The tail of the ruyi is inscribed with the symbol of "Fuk". It denotes "happiness". In Taoist feng shui, the reasoning is that the "doubling excellence" concept would double the effect of luck, such as doubling the magnitude of wealth, happiness and success. Double dragons signify growth potential, especially auspicious to generate career enhancement, promotional luck, multiplication in business opportunities, doubling of wealth resources and doubling of good fortune for the family. This Ru Yi in gold is especially for those who are seeking growth in businesses, sales and wealth multiplication. "Ji Xiang Ru Yi" connotes every path safe, smooth and sound. The Ru Yi ensures smoother paths forward, trouble-free mind and problem free endeavours. By freeing yourself from obstacles, you will therefore be able to attain your dreams successfully. The Ru Yi when crafted out of genuine jade immediately magnifies the power of this auspicious symbol a few times more. This being the reason why the ancient Empress Dowager of China and royal family members had their scepter crafted out of genuine jade. The Ru Yi ensures smoother paths forward, trouble-free mind and problem free endeavours. By freeing yourself from obstacles, you will therefore be able to attain your dreams successfully.The ruyi is suitable for those who desire to gain authority, promotion luck and good tidings in all endeavours. One may carry along the Ru Yi whenever they feel lacking in authority or needing more power/influence in negotiations and in meetings. It is also an amazing energizer to increase networking luck. For ladies wishing to gain more authority in their relationship and having better control of their kids, they will definitely have to wear the ru yi. Recommended for executives, managers and businessmen who are climbing corporate career ladders. This Ru Yi is recommended for those who like to tap greater heights in fortune, prosperity, family harmony, happiness, successful endeavours and joyous relationship. The Ru Yi ensures smoother paths forward, trouble-free mind and problem free endeavours. By freeing yourself from obstacles, you will therefore be able to attain your dreams successfully. It is perfect to increase networking luck and authority and most suitably placed in offices for executives, managers, businessmen and executives who are climbing corporate career ladders. This Ru Yi is powerful to enhance authority, to invite luck and to ensure smoothness of business/work pursuits. 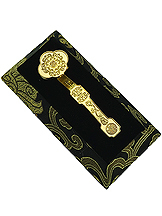 This golden Ru Yi is an exclusive looking sceptre for those seeking to increase networking luck and authority and most suitably placed in offices for executives, managers, businessmen and executives who are climbing corporate career ladders. This Ru Yi is powerful to enhance authority, to invite luck and to ensure smoothness of business/work pursuits. The ruyi comes with a gift box. This Ru Yi has the ginseng root sitting on top. Ginseng is the root of immortality consumed only by the emperors in ancient times. It is able to bring miracles by waking those who are close to death. Ginseng is called "rensheng" in chinese and together with the ruyi, it is called "rensheng ruyi" which carries the meaning a lifetime of safety and immortality. At the head of the ruyi are the bat of immortality with triple fruit of treasures "fuk luk sau" which further brings about a lifetime of all rounded fulfillment in career, wealth and health aspects. This is the best ornament for elderly people to protect them from falling prey to illness and death at an unripe age. It will ensure a life free from mishaps and unsafe events. Most Taoist followers claimed that the magical ru yi was derived from the ling tzi, a special curative fungus that cures a thousand diseases. This being the reason why almost all the olden days members of the royal family held one on their hands because it is believed to bring immortality and power. Made from bronze (being a strong metal element), it is also suitable to diffuse illness energies from flying star #2. This can also be presented to those who have health concerns to enable them find a good remedy for their sicknesses and blessing them with longevity. This Ru Yi amulet is known as "Yuan Man Ru Yi" which means the Ru Yi of Abundance. This is because the circular jade connotes the meaning abundant in chinese. The ruyi is suitable for those who desire to gain authority, promotion luck and good tidings in all endeavours. One may wear the Ru Yi whenever they feel lacking in authority or needing more power/influence in negotiations and in meetings. It is also an amazing energizer to increase networking luck. For ladies wishing to gain more authority in their relationship and having better control of their kids, they will definitely have to wear the ru yi. Recommended for executives, managers and businessmen who are climbing corporate career ladders. This colorful Ru Yi with special "four seasons characters" and sitting on a beautifully crafted stand ensure smoothness of all your endeavours throughout the four seasons, free from any obstructions and problems. The head of the sceptre has the image of the dragon which promises ultimate success to endeavours, career and leadership. Suitable for those seeking to increase networking luck and authority and most suitably placed in offices for executives, managers, businessmen and executives who are climbing corporate career ladders. The tail of the ruyi has the image of the phoenix which promises fame, recognition, respect and a colorful year ahead. Display the Ru Yi in the northwest to keep your children under control or prevent them from being rebellious. The same applies for subordinates who are defiant and tough to manage. Display the Ru Yi on your work desk to put yourself in a position of command.This Ru Yi is powerful to enhance authority, to invite luck and to ensure smoothness of business/work pursuits. This bronze Ru Yi is made with 2 fortune bats clinging on the sceptre. The fortune bats represent blessings of prosperity, happiness and longevity. Suitable for those seeking to increase networking luck and authority and most suitably placed in offices for executives, managers, businessmen and executives who are climbing corporate career ladders. This Ru Yi is powerful to enhance authority, to invite luck and to ensure smoothness of business/work pursuits. Suitable as paper weight on work desk as well. This popular bronze Ru Yi is made with 2 fortune bats clinging on the sceptre. Due to many feng shui masters' demand for this item to have gold finish, we finally sent them to a local gold smith to have them genuinely gold plated 24k. The fortune bats represent blessings of prosperity, happiness and longevity. Suitable for those seeking to increase networking luck and authority and most suitably placed in offices for executives, managers, businessmen and executives who are climbing corporate career ladders. This Ru Yi is powerful to enhance authority, to invite luck and to ensure smoothness of business/work pursuits.